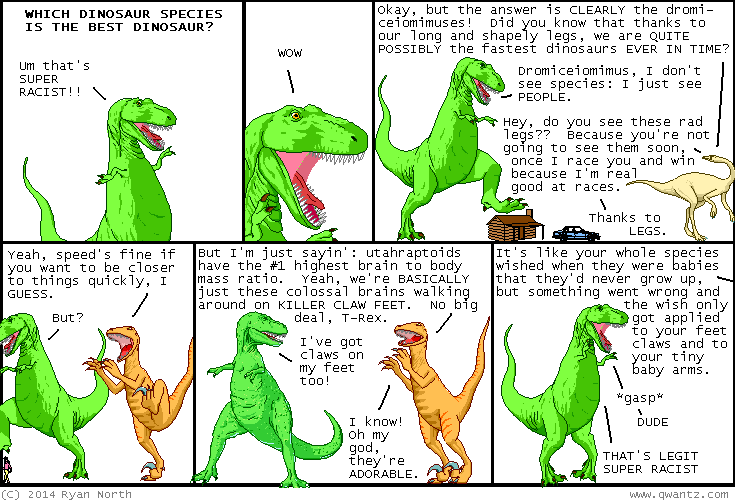 Dinosaur Comics - July 1st, 2014 - awesome fun times! –Because for some reason I totally believe that's your name! July 1st, 2014: Behold, a comic that uses "race" as in "running quickly" and as in "concept of genetic identity" in the same strip! AND I DIDN'T EVEN REALIZE THAT UNTIL AFTER I'D WRITTEN IT EITHER!! All I can say is WOW um I guess I like to use the same word over and over. Thanks, homographic homophonic homonyms!